NR FINE SIGNED FIRST STATE 1ST/1ST EDITIONSTHE FOUNDATION TRILOGYISAAC ASIMOV. FIRST STATE OF THE FIRST EDITION, FIRST PRINTINGS. Signed on a laid in signature. Gnome Press, New York, 1951, 1952, and 1953. FIRST STATE of the First Edition, First Printings Near Fine, clean crisp books, Signed on a laid in signature, near fine unclipped dust jackets. This listing is for the First State, First Printings of the FOUNDATION TRIOLOGY, a set of three near fine stated first edition books by Asimov, one signed on a laid in signature. With publication dates of 1951 for FOUNDATION, 1952 for FOUNDATION AND EMPIRE, and 1953 for SECOND FOUNDATION. Published by Gnome Press, New York. A handsome set of this trilogy consisting of first state dust jackets, and stunning clean near fine first edition books. Stated First Edition, First Printing, Signed on a laid in signature: Clean, bright book with a stunning near fine first state dust jacket, not price-clipped. The book is in beautiful condition with blue cloth boards, with red titles to spine, and a galaxy image to front. Includes a laid-in signature clip which is signed and dated by Asimov. The boards are in crisp condition, with clean cloth, sharp corners, one tip very slightly pushed, and no edgewear. The binding is tight and square and the book has no edgewear. The internal body pages and end papers are clean and flat with No marks, No stains, No writing, No inscriptions, No bookplates, No tears, No bent pages and No foxing. Beautiful clean crisp, highly collectible example of this title appearing as unread! The original extremely scarce first edition, first state dust jacket is in great condition with strong vibrant colors. The dust jacket has benefited from very slight restoration the spine tips by an expert paper conservator and presents as a near fine example. The jacket has No chips, No edgewear, No stains, No rubbing and No foxing. Stated Stated First Edition, First Printing: Clean, bright book with a near fine stunning first state dust jacket, not price-clipped. The book is in near fine beautiful crisp condition with red cloth boards with unfaded black titles to spine, and a galaxy image to front. The boards have clean cloth, with sharp corners, one very tiny tip bump, and no edgewear. The binding is tight and square. Slight hint of rubbing along bottom edge. The internal body pages and end papers are clean, with no owner names, no bookplates and no bookstore stamps. The internal pages crisp and flat with No marks, No writing, No stains, and No foxing. A beautiful example of this title, appearing as unread! The dust jacket has benefited from slight restoration to the spine tips by an expert paper conservator and presents as a near fine example. Stated Stated First Edition, First Printing Clean, bright book with a near fine first state dust jacket, not price-clipped. The book is in beautiful crisp condition with light blue boards, with brown/red titles to spine. The boards are in crisp condition, with clean cloth. The book has sharp corners and no edgewear. The end papers have prior owner stamps located on the paste down please see images showing the name Pastor W. The stamp is otherwise covered when the dust jacket is on the book as it is located underneath the front inner flap of the jacket. The internal body pages are clean and flat with but two pages with a light corner crease, otherwise with No marks, No stains, No writing, No bookplates, No tears, No bent pages and No foxing. Beautiful clean crisp, highly collectible example of this title. TThe original extremely scarce first edition, first state dust jacket is in great condition with strong vibrant colors. The dust jacket has benefited from very slight restoration to the spine tips by an expert paper conservator and presents as a near fine example. 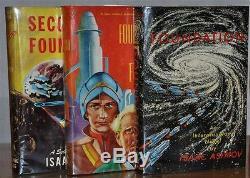 Scarce near fine trilogy in beautiful collectible condition, with a laid in signature by Asimov. Asimovs acclaimed Foundation Trilogy, was the winner of the 1966 Hugo Award for Best All-Time Series. Would make a wonderful gift and investment for an Asimov collector. Create listings that get noticed! With Auctiva's 1,800+ Templates. The item "NR FINE SIGNED FIRST STATE 1ST/1ST EDITIONSTHE FOUNDATION TRILOGYISAAC ASIMOV" is in sale since Saturday, July 23, 2016. This item is in the category "Books\Antiquarian & Collectible". The seller is "iwc_2004" and is located in New Canaan, Connecticut. This item can be shipped to United States, all countries in Europe, all countries in continental Asia, Canada, Australia.